On this week’s Monday, the crème de la crème of Europe’s Agro business sector gathered together with several ministers and former African heads of states to discuss the future and potentials of African agriculture. Among the participants, representatives of several lighthouse projects shared their vision and their experiences in agrobusiness. It was a huge success for Latitia Mukungu: Far away from home in the freezing cold Berlin, the seventeen year old entrepreneur from Kenya entered the stage in the city’s glamorous Adlon Hotel, to give the speech of her life so far. In a truly inspiring speech, Laetitia told the audience about her social business project in Bukura and Butere. 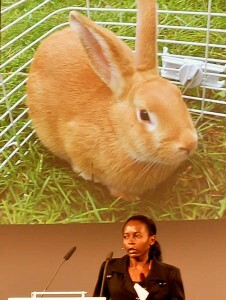 During her extensive presentation about the way she first formed the Rabbit Science Association (RSC) and later implemented a local Women Rabbit Association (WRA), a legion of highly paid European businessmen followed the young Kenyan girl with steadily growing astonishment. In vivid, clear and precise words Latitia explained how she has started to change her surrounding world with a few rabbits and how she is managing to improve education on the one hand – and from the simple economic point of view “to meet the demand for rabbit meat”. Among these efforts, she set up a local micro-finance bank in order to cover the members’ and participants’ needs such as school fees or expenditures for micro-business ventures. Every child whether poor or rich has the right to education! With that, she is aiming for a higher goal: Latitia plans to expand the business, dubbed the “Rabbit Women Association” in order to increase the effectiveness of the community support. Besides this lighthouse panel, two vivid discussion rounds took place on stage concerning ‘Making Business Work and Fit for Africa‘ and ‘Policy Enabling Frameworks ‘ respectively. While the first was rather dominated by European investors and businessmen, the framework-discussion was joined by three ministers of agriculture from three African states. Among the participants were Dr. Baba Dioum, Coordinator General of the Conference of Ministers of West and Central Africa, Dr. Betty Achan Ogwaro, Minister of Agriculture and Forestry of the Republic of South Soudan and José Condugua António Pacheco, Minister of Agriculture of the Republic of Mozambique. During the discussion one general consensus among the participants became apparent: All of them agreed that agriculture has a prosperous and a promising future in many regions in Africa. Opinions differed on the point of free markets particularly the European food markets and free access for all countries to those. The ministers agreed on the point that European markets should first be opened for African economies in order to facilitate a free and fair flow of goods and products in both directions. On the comment of Dr. Gerd Müller, Parliamentary State Secretary to the Federal Minister of Food, Agriculture and Consumer Protection (Germany), who claimed European markets were free of any trade barriers for any product from African states, the present minister of Mozambique replied with a brief but demonstrative examination of the tremendous difficulties his government in Maputo faces: it took years until the first bananas from Mozambique could finally be exported to the European Union. Besides the vivid discussions and the interesting statements particularly by the ministers from Burkina Faso, South Sudan and Mozambique, it was quite sobering to hear a governmental official from Germany claiming that there was no sense of protectionism in Germany and the European Union at all. Besides this inversion of the facts, Müller continued with denouncing the omnipresence of corruption as a deeply rooted problem on the African continent. Instead of complaining about this certainly existing problem, the State Secretary should have stopped picking holes and return to the forum of discussion and contribute constructive critics and arguments to the debate. All in all, the guests of this year’s ACGO Africa Summit experienced a promotion event organized by the main sponsors which still offered an interesting platform for discussion. In between the leading speeches of the sponsor representatives, participants and speakers introduced some interesting points which highlighted the up and coming future of Africa’s agricultural sector. As with any other sector, it became clear that it is difficult to generalize for the whole of Africa since regions differ enormously from each other, may it be socially, politically, economically or geographically. The summit’s closing speeches were given by the former presidents of Ghana and Nigeria, President John Agyekum and Kufuor and President Olusegun Obasanjo. The two honorable presidents stressed the high importance of cooperation between African nations and foreign agro-investors on equal terms. If that would be taken into account and if decision makers would truly pay attention on the cooperation with local communities and institutions, then the agricultural sector could be prosperous throughout Africa, leading to a promising future.